Martin Susters celebrates scoring one of his four goals against Bracknell. 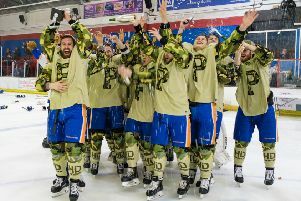 The Latvian-born talent was the star of the show last Sunday as Phantoms lifted the NIHL Division One South play-offs crown to complete a hat-trick of honours in a never-to-be-forgotten season. Susters scored four and created two of Phantoms’ goals in their 6-4 second-leg triumph against Bracknell at Planet Ice which sealed a 13-8 verdict on aggregate following a 7-4 victory in Berkshire the previous evening. The 20 year-old predictably earned rave reviews from head coach Slava Koulikov following a virtuoso performance, but Susters himself was quick to share the acclaim. “The credit should go to all the guys,” he said. “You don’t win a trophy because of what one player does. It’s down to everyone. “We always knew we were going to have two huge battles against Bracknell but we made sure we did the simple things right and played our hockey. “To score four goals in such a big game was obviously a great feeling and I have to thank the other guys who were on fire and created the chances for me. “I took a great pass from Corey (McEwen) and I managed to roof the puck for the first one and then Petr (Stepanek) found me with a nice pass for the second and I managed to hit a one-timer past the goalie. “It was great play again by Corey for my hat-trick goal. He found me in the slot and I had an easy job to finish it to be honest. But Susters is not a man to dwell on past achievements. He has already consigned his Sunday exploits to the memory bank with the focus now shifted towards another trophy tilt this weekend. Phantoms take part in the season-ending NIHL Final Four in Coventry and Susters’ sights are set on more silverware at the scene of the club’s English Premier League play-offs glory of 2015. He added: “We’ve had some great success this season but it is history now and we need to focus on going to Coventry and winning another trophy.